When you have missing teeth that cause gaps in your mouth, a bridge might be your best option for repairing your smile. 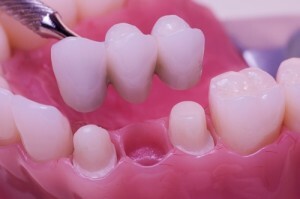 Bridges use crowns placed on the teeth surrounding the gap to literally bridge the gap. The anchor teeth (abutments) on either side of the gap are filed down to receive the crowns that have an attached prosthetic tooth (either made out of porcelain fused to metal or ceramic) between them. Having a gap between your teeth, where a tooth once was, can lead to serious problems and discomfort if not treated. Eventually, your teeth will shift to try and fill in the gap naturally. This can lead to an uneven bite. Temporomandibular joint (TMJ) disorders and gum disease can result from the imbalance of missing teeth. When preparing for a bridge, the abutment teeth are reduced to prepare for the crown. Then, a mold will be created of the teeth and surrounding gums. The mold will be sent to a lab where the bridge will be produced to fit your mouth exactly. During this time, a temporary bridge will be put in place in order to protect the exposed teeth. Once the bridge is finished, it will be checked to make sure it fits perfectly in your mouth. If the fit is just right, it will be cemented into your mouth. Bridges will last between five and 15 years (but can last much longer). Proper dental hygiene is essential in keeping your bridge in good condition. The length of time it lasts will depend on a variety of factors, including the amount of wear and tear it receives on a daily basis. With appropriate care, your bridge can last you a lifetime. If you have further questions or would like to make an appointment, please call 407-905-9888.